With drooping heads and tremulous tails, they mashed their way through the thick mud, floundering and stumbling between whiles, as if they were falling to pieces at the larger joints. As often as the driver rested them and brought them to a stand, with a wary 'Wo-ho! so-ho-then!' the near leader violently shook his head and everything upon it--like an unusually emphatic horse, denying that the coach could be got up the hill. Whenever the leader made this rattle, the passenger started, as a nervous passenger might, and was disturbed in mind. Two other passengers, besides the one, were plodding up the hill by the side of the mail. All three were wrapped to the cheekbones and over the ears, and wore jack-boots. Not one of the three could have said, from anything he saw, what either of the other two was like; and each was hidden under almost as many wrappers from the eyes of the mind, as from the eyes of the body, of his two companions. In those days, travellers were very shy of being confidential on a short notice, for anybody on the road might be a robber or in league with robbers. As to the latter, when every posting-house and ale-house could produce somebody in 'the Captain's' pay, ranging from the landlord to the lowest stable non-descript, it was the likeliest thing upon the cards. So the guard of the Dover mail thought to himself, that Friday night in November, one thousand seven hundred and seventy-five, lumbering up Shooter's Hill, as he stood on his own particular perch behind the mail, beating his feet, and keeping an eye and a hand on the arm-chest before him, where a loaded blunderbuss lay at the top of six or eight loaded horse-pistols, deposited on a substratum of cutlass. Charles Dickens, A Tale of Two Cities. A Story of the French Revolution, 1859. Book I, 'Recalled to Life', Chapter II: 'The Mail'. Samuel Bough, R.S.A. (1822-1878), London from Shooter's Hill, 1872. Image: Sotheby's [larger image at the link]. The painting fetched 68,750 GBP in the auction on 15 December 2016. While staying at Old Charlton in Kent, Bough and his host, Mr. Macbeath, walked to Shooter's Hill, on the look out for a subject. 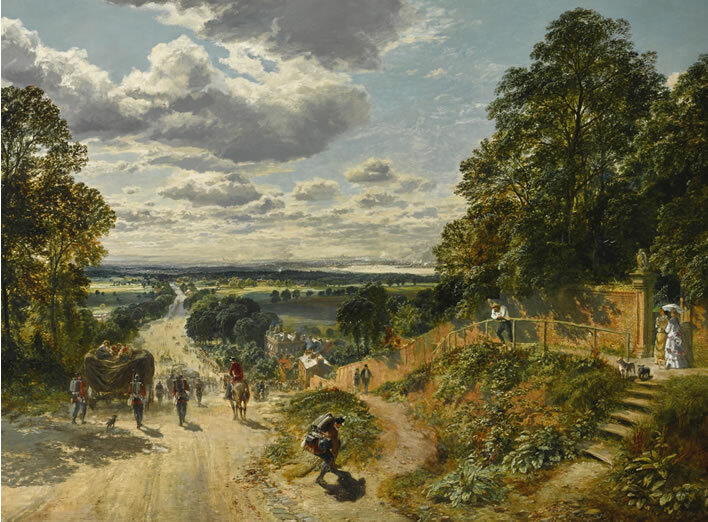 Taking his sketch book and pencil, the artist ran in a hasty outline of the leading points of the vast scene which lay before him; then made a few loose jottings; and from this meagre amount of material, sprang the large picture of "London from Shooters Hill," exhibited at the Scottish Academy in 1872, and at the Royal Academy two years later. The effect is that of a cloudy sky, and yet a thundery atmosphere hangs about it. A baggage waggon passes along. Soldiers, dusty and travel-worn, guard the waggon as it wends its way slowly towards the great city. Numbers of onlookers gather in front of a public house. Near the park gates the artist has introduced his wife and niece, with their favourite dogs. A soldier in the rear stoops to fasten his boot-lace; and on the opposite bank a gaudily dressed female sits looking at him.' (Sidney Gilpin, Sam Bough, R.S.A., Some Account of his Life and Works, 1905, pp.172-173).